Matt comes in and sits down with Gemma. Harold doesn't appear to notice for some reason(!) He offers Gemma a lift home. She suggests he skips Tech this afternoon - Gemma has some frees this afternoon, and they could wag together. The police won't tell Jim anything over the phone - they want him to come down to the station. Helen is a bit frantic but reigning it in. Gemma and Matt are messing about, tickling each other. They have a little pash and talk about how awful the ban is. Matt says they'll just have to ride it out. They decide to go for a drive so they can have some privacy. 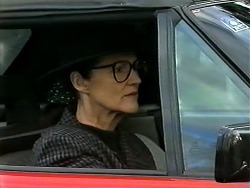 Unfortunately, Dorothy goes past in her car and sees them. 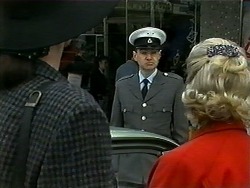 Eddie staggers in with the women's dresses and tells Madge it's a special consignment from Trevor. Madge says Trevor's stock is always dodgy, but then again, the dresses are good quality. Madge has a look through and Eddie says she can have one for $60. 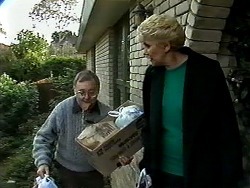 Dorothy comes up to Helen and says she's illegally parked in a disabled parking space. Helen says she was in a hurry. Dorothy goes on and on. 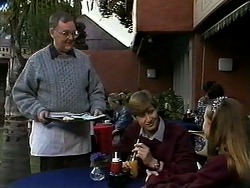 While Dorothy is talking, a parking warden comes up and gives Helen a ticket. Eddie is sorting out the dresses so he can sell them door-to-door. There's a knock at the door and it's Dorothy. Eddie immediately tries to sell her a dress. MADGE: Just say yes, Dorothy, it's quicker. Dorothy has come to tell Madge about Gemma wagging school with Matt. Madge is horrified. At Eddie's insistence, Dorothy takes a couple of dresses home to try on. 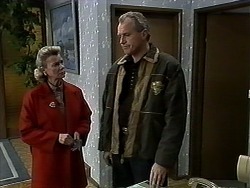 Jim is back from the police station - they haven't found Beverly yet. But they asked him to look at a body which fitted Beverly's description. It wasn't Beverly, but Jim is very upset about it. He's worried that Beverly could commit suicide too. Ryan asks Gemma where she was this afternoon. She is evasive and Ryan is cross. Harold comes over and tells her he knows that she wasn't at school this afternoon. 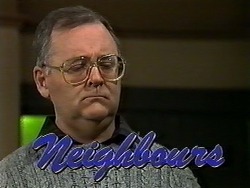 Harold says he is very disappointed in Gemma. 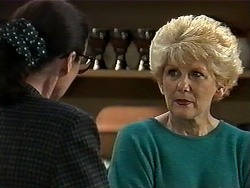 Madge is ranting to Helen about Gemma. 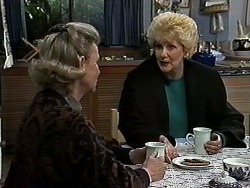 Helen tells Madge about her run-in with Dorothy and the disabled parking space. Helen had a fine of £30. Madge says she might be able to do something about the fine - some of the parking attendants are a bit over-zealous. Beverly is sitting alone in a cafe. Her flight to Adelaide is called and she looks ahead blankly, remembering. She flashes back to an argument when Jim accused her of having an affair. Then she flashes back to Jim asking if her baby was his. Then to Beverly saying she wants a separation. She starts to cry. Des and Jim are talking about what happened with the body ID today. 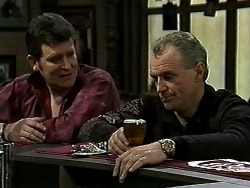 Des wonders if Jim could contact Ewan to see if he knows where Beverly is. Jim says he can't - he'd look like an idiot if Beverly wasn't there. Matt has come over to help Gemma to face Madge. Gemma doesn't want to - she wants Matt to go home before Madge freaks on finding him in the house. She hustles him out of the back-door, but he doesn't want to go. Madge comes in, in a bad mood after going shopping with Harold. Gemma finally gets Matt to leave. Madge tells Gemma she's in big trouble - she's fed up of Gemma breaking her word. From now on, Harold be take her to and from school. She sends Gemma off to do her homework. Dorothy has come to apologise for keeping Helen talking so she got a fine. They chat about Eddie's dresses. Madge comes in and tells Helen that she's had the ticket quashed - "What are friends for". 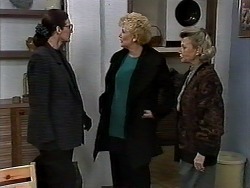 Dorothy accuses Madge of being corrupt. 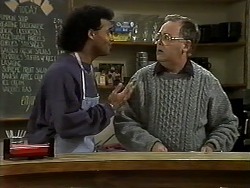 Gemma is going to call Tom, but Harold tells her not to bother. She's very upset about not being able to see Matt. 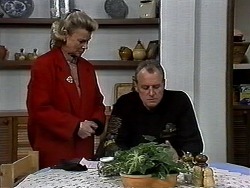 Harold tells Gemma that she must obey the rules. Gemma says she's going to carry on seeing Matt whatever - there's no way Madge and Tom can stop her.